Anthocharis midea, commonly known as falcate orangetip, a New World butterfly, is presented. Three New World plants (common blue violet, Virginia bluebells, sickle-pod) that are staple nectar sources for falcates are described. Falcate orangetip's close relationship throughout its life cycle with sickle-pods and other plants in the mustard family is highlighted. Anthocharis midea is commonly known as falcate orangetip butterfly. In its common name, falcate (Latin: falx, “sickle”) refers to the sickle-shaped curve at the apex, or tip, of each forewing. Orangetip relates to the color of the forewing tips, which are orange in males but white in females. A New World native, Anthocharis midea sweeps from southern New England southwest into Kansas, eastern Oklahoma, and southern Texas. The Florida Panhandle, eastern Nebraska, and southern Wisconsin also welcome local populations, which are disjunct, that is, separate, from the main, contiguous sweep north of the Gulf Coast and south of the Great Lakes. Open wetness characterizes habitat preferences for Anthocharis midea. Ideal locales are open swamps and open, wet woods along waterways. Anthocharis midea occasionally haunts dry woods and ridgetops. Anthocharis midea belongs to the family Pieridae, whose typical coloration shifts from white to yellow or orange as a backdrop for distinct black spots. True to its family, Anthocharis midea has white uppersides. Females have completely white uppersides whereas males have orange tipped forewings. A round black celled spot appears on the upperside of each forewing. A fine green pattern marbles across the underside of each hindwing. Wingspan measures 1-3/8 to 1-3/4 inches (3.5 to 4.5 centimeters). 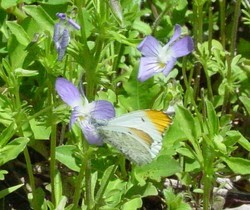 Falcate orangetips are enchanted by violets (genus Viola) and Virginia bluebells (Mertensia virginica). Never weaned from mustards (family Brassicaceae), falcate orangetips devotedly devour the leaves of mustards as a caterpillar and sip Brassicaceae nectar as a butterfly. Viola sororia is commonly known as the common blue violet. A New World native perennial, common blue violets originate in eastern North America. 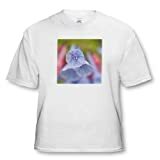 In Canada common blue violets occur natively in the eastern provinces of Quebec and Ontario and, disjunctively, that is, separately, in the central prairie province of Saskatchewan. In the continental United States, common blue violets’ extensive nativity encompasses the nation’s capital, Washington, D.C., plus every state from the eastern seaboard through the Gulf Coast, the Midwest, and the Great Plains. Their nativity ceases at the borders of the Rocky Mountain states. Common blue violets occur natively in every county in Connecticut, Illinois, Maine, Massachusetts, New Hampshire, and Vermont. In four states they are distributed natively throughout, with the exception of one county: in Delaware apart from the central county of Kent, in New York except for the western county of Schuyler, in Ohio apart from the central county of Madison, and in Rhode Island except for the southernmost county of Washington. Common blue violets are honored with state flower status by Illinois, New Jersey, Rhode Island, and Wisconsin. The U.S. Department of Agriculture Plant Hardiness Zones Map, which classes plants according to the coldest temperatures at which they remain viable, places common blue violets in Zone 4 (-30° to-20° Fahrenheit; -34° to -29° Celsius) through Zone 9 (20° to 30° F; -7° to -1° C). Common blue violets have a spread of 6 to 16 inches (15 to 40 centimeters) and a height of 2 to 6 inches (5 to 15 centimeters). Leaves are rounded, broad, and toothed. Coated with down, leaves have a light, soft texture. Leaf length usually measures under 4 inches (10 centimeter). Light centers, shading from white to pale yellow orange, provide effective contrast to the flowers’ main coloration of variations of the violet range, which falls in the blue to purple spectrum. Floral width may measure up to 1 inch (25 millimeters). Common blue violets are greatly prized for their long-standing culinary, medicinal, and perfume applications. Culinary uses include extracting violet essences for flavoring in desserts and liqueurs and adding fresh flowers and young leaves to salads. The contributions of violets to the perfume industry are legendary. The Cherokee, who called themselves Tsalagi or Aniyvwiyaʔi (“principal people”), inhabited the southeastern United States, especially settling in Georgia, North Carolina, South Carolina, and eastern Tennessee. The Cherokee sought recourse to common blue violets in preparing infusions for treating colds, coughs, dysentery, and nasal catarrh. An infusion was valued also as a spring tonic. A poultice of leaves dissipated headaches while a poultice of crushed roots healed boils. Common blue violets are appreciated by butterflies for their widespread distribution and, hence, for their extensive nectar availability. Falcate orangetips look upon common blue violets as cherished mainstays. As they confidently perch for nectaring, they blend perfectly, apart from the absence of a violet counterpart, with the floral coloring. Especially male falcates mirror, with their white, orange-tipped uppersides, the white and yellow orange floral centers. The fine green marbling of the hindwing undersides also harmonizes with the floral foliage. 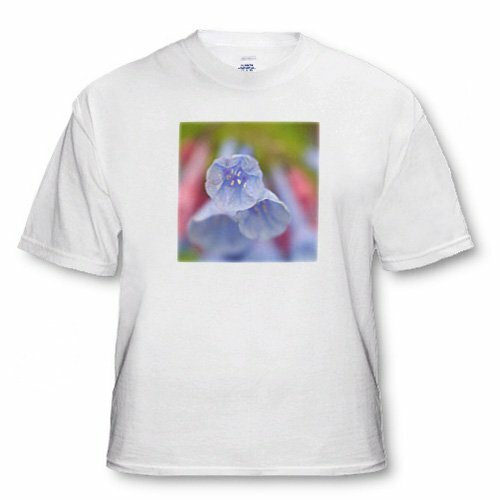 Mertensia virginica is commonly known as Virginia bluebell, Virginia cowslip, lungwort oysterleaf, and Roanoke bells. A New World native perennial, Virginia bluebells originate in eastern North America. In Canada, Virginia bluebells occur natively in the eastern provinces of Quebec and Ontario. In the continental United States, Virginia bluebells' nativity encompasses the nation’s capital, Washington, D.C., plus twenty-six states from the eastern seaboard west through the midwest: Alabama, Arkansas, Delaware, Georgia, Iowa, Illinois, Indiana, Kansas, Kentucky, Maine, Maryland, Massachusetts, Michigan, Minnesota, Mississippi, Missouri, North Carolina, New Jersey, New York, Ohio, Pennsylvania, South Carolina, Tennessee, Virginia, West Virginia, and Wisconsin. In two disparate states, Virginia bluebells are found natively in only one county: in Maine only in the southeastern coastal county of Sagadahoc and in Mississippi only in the northeastern corner county of Tishomingo. Virginia bluebells are hardy for Zone 3 (-40° to-30° Fahrenheit; -40° to -34° Celsius) through Zone 9 (20° to 30° F; -7° to -1° C). Virginia bluebells have a spread of 12 to 24 inches (30 to 60 centimeters), with an equiproportionate height of 12 to 24 inches (30 to 60 centimeters). Grey green leaves have an oval shape and a length of 8 inches (20 centimeters). Buds are blue tinged extensively with pink. Bell-shaped flowers are formed by the tubular fusion of five petals. Sky blue flowers, which open in clusters in early spring, nod enchantingly and amicably with nature’s awakening breezes. Native Americans had recourse to Virginia bluebells for a variety of ailments. In Cherokee ethnobotany, Virginia bluebells served as a pulmonary aid in treating whooping cough and as a remedy for tuberculosis. The Iroquois, referring to themselves as Haudenosaunee (“they are building a long house”), settled in the northeastern United States, mainly in upstate New York and especially in the west central section throughout the Finger Lakes region. By steeping the roots of Virginia bluebells, the Iroquois prepared an infusion which served as an antidote for poisons. Boiling the roots produced a decoction which treated venereal disease. Falcate orangetips happily flit directly to Virginia bluebells, which they favor and savor. Falcate orangetips display a lifelong devotion to plants in the Brassicaceae family, commonly known as cabbages, crucifers, or mustards. Most favored status is bestowed first upon rock cress (genera Arabis and Boechera) and secondarily upon winter cress (genus Barbarea). Shale barren rock-cress (Arabis serotina), a host plant for falcate orangetips, is an imperiled species native only to Shenandoah Valley of western Virginia and of eastern West Virginia. Erysimum canadense var. glabrescens Kuntze. One synonym, Arabis molis Raf., has been determined to be illegitimate, that is, unacceptable. Two synonyms have unresolved status: Turritis Canadensis Nieuwl. and Turritis lyrata Raf. A New World native biennial, sickle-pod originates in eastern North America. In Canada, sickle-pod occurs natively in the eastern provinces of Quebec and Ontario. In the continental United States, sickle-pod has native status in the nation’s capital, Washington, D.C., plus thirty-six states. Nativity encompasses the eastern seaboard, with the exception of Maine, and sweeps across the Gulf Coast states, the Midwest, and the Great Plains. Nativity ceases at the borders of the Rocky Mountain states. In three separate states sickle-pod has a native appearance in only one county: in Louisiana in the northwestern county of Bossier, in North Dakota in southeastern county of Sargent, and in Rhode Island in northernmost county of Providence. Preferring shade to partial sun, sickle-pod typically thrives in dry open woods and rocky slopes. Arabis and Boechera species generally are hardy to Zone 5 (-20° to-10°Fahrenheit; -29° to -23° Celsius) through Zone 9 (20° to30° F; -7° to -1° C). Arabis canadénsis L. Sickle-pod. Figure 2078. Sickle-pod reaches a height of 1 to 3 feet (0.3 to 0.6 meters). Its stout stems are mostly unbranched. Occasional branching occurs towards the upper part of the stem. Leaves are hairy and small. Leaves taper at the tip and the base. Irregularly hairy, leaves are sparsely toothed. Length measures 1 to 4 inches (2.54 to 10.16 centimeters), and width is about 1 inch (2.54 centimeters). Basal leaves, which are at the base of the plant, are the largest. Flowers, which are white with a width of 1/3 inch (8.46 millimeters), have four petals, which are narrow with blunt tips. Flowers form loose clusters near the top of the stem atop long stalks. Fruit is borne in dry, elongated pods, characteristic of the mustard family. Known as silique (Latin: siliqua, “seed pod”), these flat pods measure 3 to 4 inches (7.62 to to 10.16 centimeters) in length. The initial straight, horizontal form of the pods soon curves and droops. Pods consist of outer valves, or walls, which enclose a replum (Latin: replum, “doorcase”), a central partition to which seeds are attached. At maturity the two outer valves of the pod fall off, leaving behind the replum. Seeds are small with an egg or heart shape. Fine papery wrapping, which rims seeds as wings, encourages wind dispersal. Kudzu (genus Pueraria), an undaunted vine native to southern Japan and southeast China, has climbed, coiled, and trailed its way to predominance as an undesirably invasive non-native species throughout the southeastern United States. Virtually unstoppable and uncontrollable because of its rapid growth, kudzu, however, cannot withstand its lethal foe, Myrothecium verrucaria, a fungus hosted by sicklepods. Playing out their lives from beginning to end with sickle-pods, orangetips convey an uncomplicated understanding of their place in their ecosystems. By placing minimal yet precise demands on the quantity of synecological (Greek: σύν, syn, “with” + oικoλoγία, ecologia, “house” + “study”), that is, coexisting, constants, orangetips focus on the quality of the components necessary for their survival. Unfortunately, the narrow focus of falcate orangetips’ pleasures facilitates adversity, such as life-threatening consequences of diminished nectar sources, which are involved in their own struggles in the food chain and in the cycle of life. For example, sickle-pods have endangered status in Florida and threatened status in New Hampshire. Unlike some butterflies who find solace for their nectarous cravings from any and all floral candidates, falcate orangetips find pleasure in selectivity. Common blue violets, Virginia bluebells, and sickle-pods all are favored by orangetips as best nectars forever (BNFs). Interestingly, sickle-pod has the most modest, most retiring, and most unremarkable appearance of these three floral favorites. Yet, the top spot in the triumvirate is occupied, clearly and always, by sickle-pods, which, having won this butterfly’s heart --- or, rather, dorsal tube --- at creation, epitomizes the best nectar forever for falcate orangetips. Britton, Nathanel Lord, and Addison Brown. An Illustrated Flora of the Northern United States, Canada and the British Possessions from Newfoundland to the Parallel of the Southern Boundary of Virginia, and from the Atlantic Ocean Westward to the 102d Meridian. Vol. II: Amaranthaceae to Loganiaceae. New York: Charles Scribner's Sons, 1913. The Century Dictionary: An Encyclopedic Lexicon of the English Language. 10 volumes. New York: Century Co., 1906. Moerman, Daniel E. Native American Ethnobotany. Portland OR: Timber Press, 1998. Moerman, Daniel. Native American Medicinal Plants: An Ethnobotanical Dictionary. Portland OR: Timber Press, 2009. Ortho's All About Attracting Hummingbirds and Butterflies. Des Moines IA: Meredith Books, 2001. Seitz, Adalbert, ed. 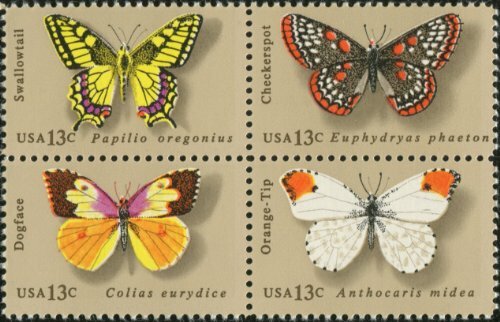 The Macrolepidoptera of the World; A Systematic Description of the Hitherto Known Macrolepidoptera. Vol 5. Stuttgart: Alfred Kernen, 1924. Stormonth, James. Etymological and Pronouncing Dictionary of the English Language. Fifth edition. Edinburgh and London: William Blackwood and Sons, 1879. Weed, Clarence M. Butterflies Worth Knowing. Little Nature Library. Garden City, NY: Doubleday, Page and Company, 1917. 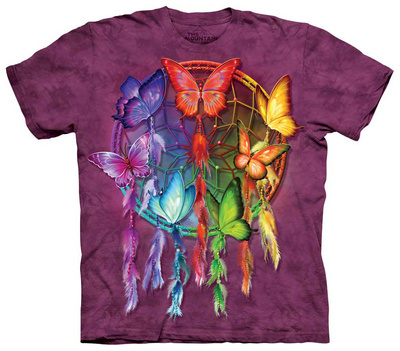 Tees available in light blue, pale pink, grey, or white ~ Toddler sizes in 100% cotton. Issued on June 6, 1977 in Indianapolis, IN.